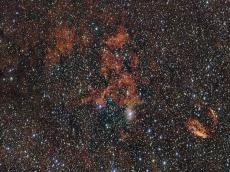 Gleaming through these crimson gas clouds are rarely seen, short-lived stars. Classified as O-type stars, they only burn for tens of millions of years before disappearing. For every three million stars in the Milky Way, only one is O-type. They are shrouded not only in dust, but also mystery. Astronomers are unsure how these giant stars form, and they don’t often get the chance to observe them. The ones buried in the red nebular cloud RCW 106 seen at the center of this image released Wednesday are some 12,000 light-years away, according to the European Southern Observatory. They measure dozens of times bigger than the sun and are nearly a million times brighter. Researchers are interested in understanding how they devour enough gas to sustain their size and power. They burn so bright that they shine outside the realm of visible light: they are only visible under telescopes sensitive to certain wavelengths, which adds to their elusiveness.